Around the holiday season for as long as I can remember, my mom has made these delicious chocolate covered cherry cookies. They are, I can say without a doubt, my most favorite cookies in the whole wide world. These cookies are not healthy by any stretch of the imagination, but you guys know I’m a firm believer in the fact that being healthy means not ALWAYS being healthy, if you know what I mean. Sure, I probably could have healthified this recipe, but sometimes it’s good to indulge a little in things that are worth it, and these cookies, for me, are definitely worth it. Over Christmastime, Matt and I (with some assistance from my mom – “make sure you don’t burn the chocolate!”) whipped up a batch of these cookies for everyone using my mom’s old tried and true recipe. I planned to share the recipe right away, but holiday relaxing got the best of me and before I knew it, it was January, and then I felt a little awkward posting a chocolate cookie recipe at the same time most people were jumping full force into new years resolution mode. I had completely forgotten about wanting to share this recipe until this week when I started seeing all sorts of chocolate recipes popping up in anticipation of Valentine’s Day. Might as well add one more to the mix, right? 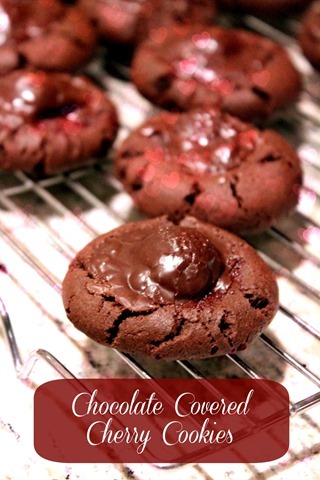 These cookies are rich and chocolately, and when you bite into them you get a burst of sweet, juicy cherry. Perfection. They would make a fabulous Valentine’s Day dessert! 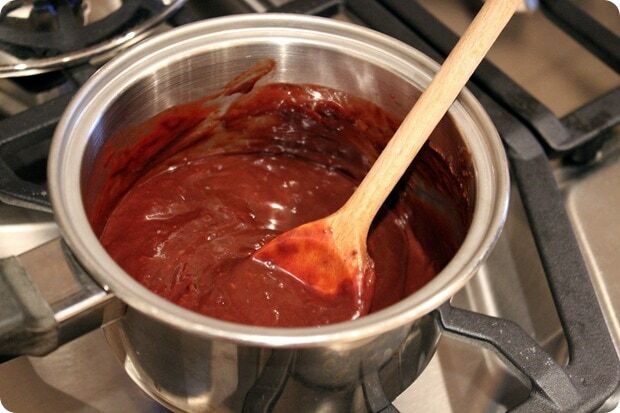 In a large bowl, stir together dry ingredients: flour, cocoa, baking powder, baking soda, and salt. In a mixer bowl, use an electric mixer on low speed to beat together softened butter and sugar until fluffy. Add egg and vanilla; beat well. Gradually add dry ingredients; beat until well blended. Shape dough into 1-inch balls. Place on ungreased cookie sheet. Press down centers with thumb. Drain cherries, reserving juice. 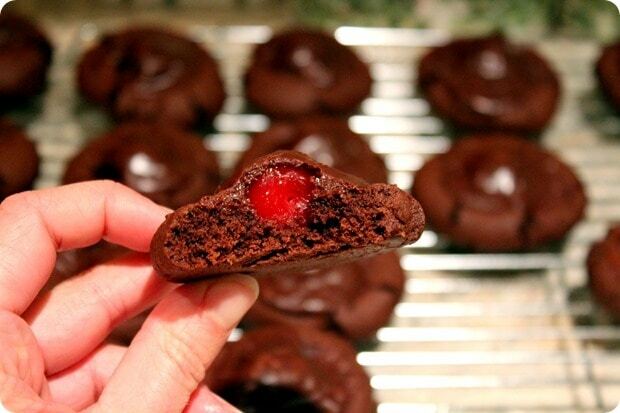 Place one cherry in the center of each cookie. In a small saucepan, heat chocolate pieces and sweetened condensed milk until chocolate melts. Take care not to burn the mixture - stir often! Once melted, stir in 4 teaspoons cherry juice. 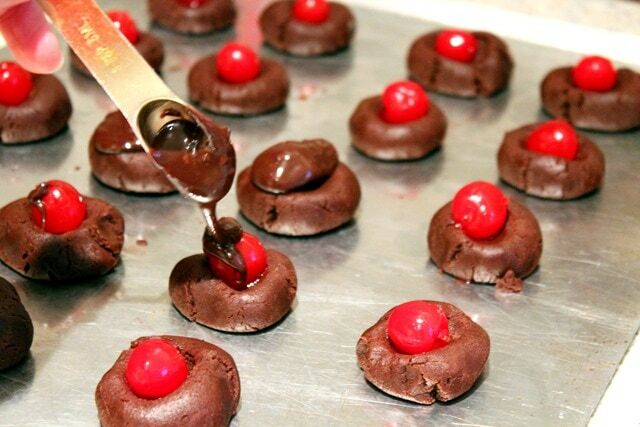 Spoon 1 teaspoon chocolate/cherry sauce over each cookie (on top of the cherry). Bake at 350 for 10 minutes. Cool on wire rack and enjoy! In the mood for chocolate, but want something less decadent? Try some of these! Next article: An Awesome a.m. Workout + Recent Eats & My RD-iversary! Wow, I’ve been waiting for this recipe ever since you mentioned it over the holidays! Nothing says Valentine’s Day quite like chocolate … and this has the right amount of decadence for the occasion. Can’t wait to try them! Haha I’m wishing I still had some, too! HOLY SMOKES THESE LOOK DELICIOUS! I’m for sure making them this Valentine’s Day! OH my! I am not a huge chocolate person but I love cherries! This could be very dangerous! I’m actually not a huge chocolate person either normally! As already mentioned, these a perfect for Valentine’s Day!!! Nothing beats an amazing family recipe. 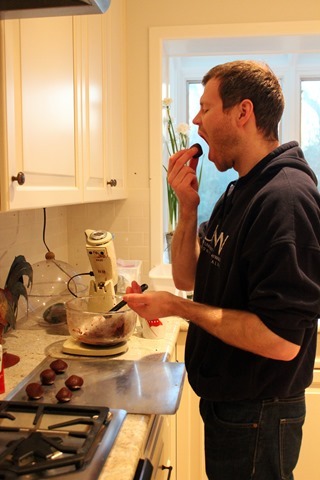 Cherries are my favorite fruit so I am always looking for new ways to devour them! Healthy or not, these cookies look amazing! Why am I not seeing the instructions? This looks like a recipe that I somehow lost years ago and have yet to find the right replacement. 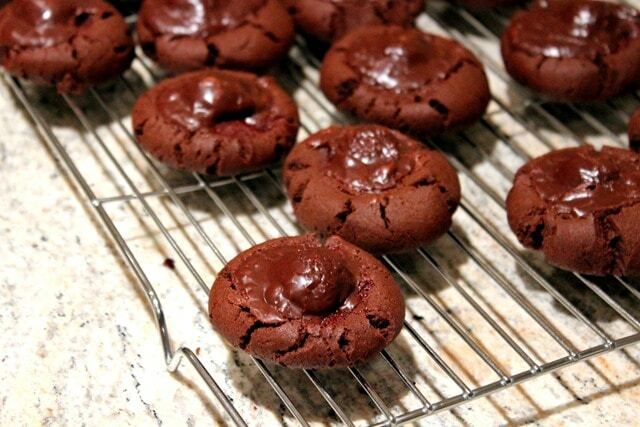 It looks like the chocolate topping is put on the cookies before baking. Is that right?